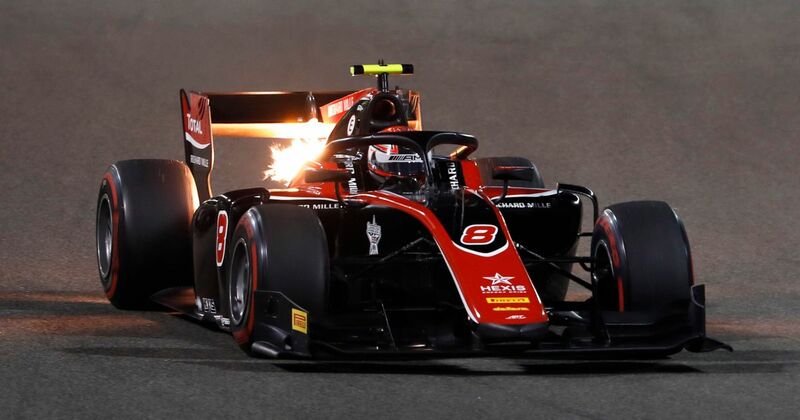 Much like in GP3, there was a technically a chance that the F2 championship leader heading into this weekend could lose it, but it was very unlikely. Russell tightened his grasp on the title by taking pole position and four extra points, leaving title rival Alexander Albon relying heavily on luck to take the championship to the final race on Sunday. At the start Albon had some luck but unfortunately for him, it was of the bad variety - he stalled on the grid. So did teammate Nicolas Latifi, who was hit hard by an unsighted Arjun Maini. Both drivers were fine, but the accident led to a safety car and a lengthy clean-up operation. Albon got going again but his race was essentially ruined as he hoped for a safety car that would never come. Russell had lost the lead to Nyck de Vries at the start but looked faster once the safety car came in. Despite only needing to cruise to the end to take the title he had a go at taking the lead, even making contact with De Vries. During the pit stop phase, Russell seized the initiative and pinched the lead back with the undercut before cruising off to his seventh win of the season and securing the championship in the process. It’s been quite a year for Russell. To win the F2 championship so convincingly in one of the most talented F2 fields for years is quite the achievement. He also joins Nico Rosberg, Lewis Hamilton, Nico Hulkenberg and Charles Leclerc as a driver who won the F2/GP2 championship in their rookie year - and they’ve all gone on to do pretty well in F1. It’s no wonder Williams has snapped him up for next year!